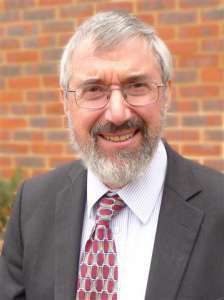 Rabbi Michael Hilton attended Quainton Hall School, Harrow and Merchant Taylors’ School, Northwood. He studied Latin, Greek and English Literature at Oxford and went on to complete a doctorate about English translations of the Anacreontea (DPhil Oxford University 1980). Michael worked as a Housing Officer with homeless families before training for the rabbinate at Leo Baeck College. He was ordained in 1987, and served as a pulpit rabbi from then until his retirement in 2017. He was Rabbi of Menorah Synagogue, Cheshire Reform Congregation (1987-1998) North London Progressive Synagogue (2000 – 2001) and of Kol Chai Hatch End Reform Jewish Community (2001- 2017). Currently Michael is Rabbi Emeritus of Kol Chai, Scholar in Residence of the Liberal Jewish Synagogue London, a governor and Senior Lecturer at Leo Baeck College, and an Honorary Research Fellow at the Centre for Jewish Studies, University of Manchester. Rabbi Michael has been involved in leading interfaith weeks since 1986, mainly at the Ammerdown Centre near Bath, and is the Jewish team leader for Oxford Three Faiths Week. He is the author of The Gospels and Rabbinic Judaism (1988) (with Fr. Gordian Marshall OP), The Christian Effect on Jewish Life (1994) and Bar Mitzvah: A History (2014), detailing the origins and development of bar mitzvah (for boys) and bat mitzvah (for girls). His current research is about the influences of Islam on Judaism.